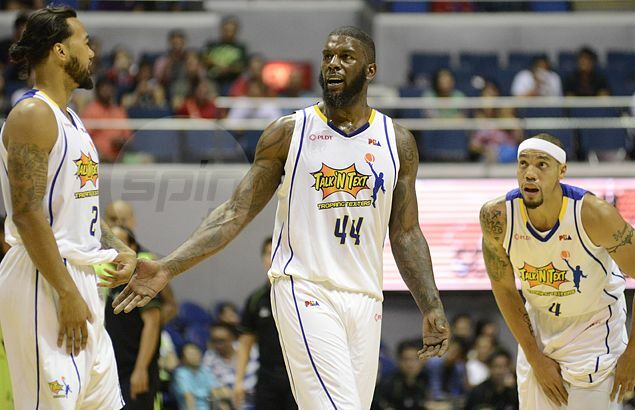 TNT import Ivan Johnson is set to miss the team's debut in the Commissioner's Cup. TALK 'N Text import Ivan Johnson has been suspended one game and fined P50,000 for figuring in a fight with two Blackwater players during a tune-up game at the Moro Lorenzo Sports Center inside the Ateneo campus. The decision was handed down by PBA commissioner Chito Narvasa, a few days after reviewing the video tapes of the incident collected from Blackwater, Talk n Text and the league's own videographer. The tune-up game was sanctioned by the league. A source told Spin.ph Talk n Text is still appealing the verdict, which will force Johnson to miss the Tropang Texters' debut in the Commissioner's Cup against the same Blackwater team on Wednesday. “Inaapela pa nila eh. Kaso mukhang nakapag decide na ang PBA commissioner,” said the source. This will be the first suspension to be handed out to Johnson, who figured in a couple of skirmishes on the way to leading TNT to the Commissioner's Cup title last year. He was fined P150,000 last year for what the league described as an 'unsportsmanlike' bump on Rain or Shine coach Yeng Guiao in the finals.